One of my favorite parts of dressing up our home has been incorporating every member into its walls and table tops, specifically the children. 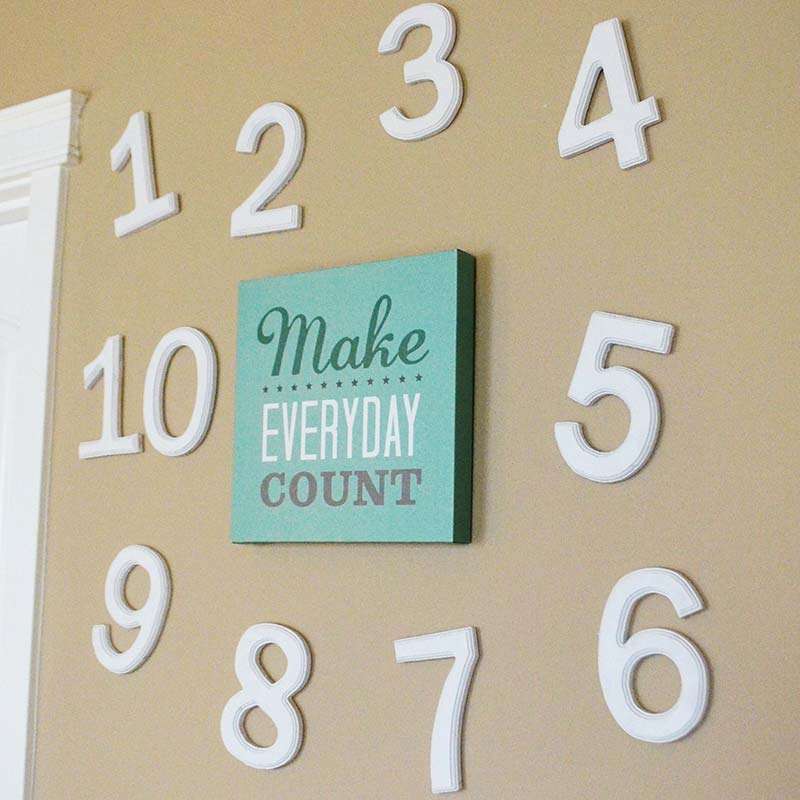 While it's easy to imagine your house quickly becoming the spitting image of a kindergarten classroom, take a look at these fun and simple ideas on how to sprinkle a bit of even your home's shortest roommates into its décor. Let’s start with the obvious. 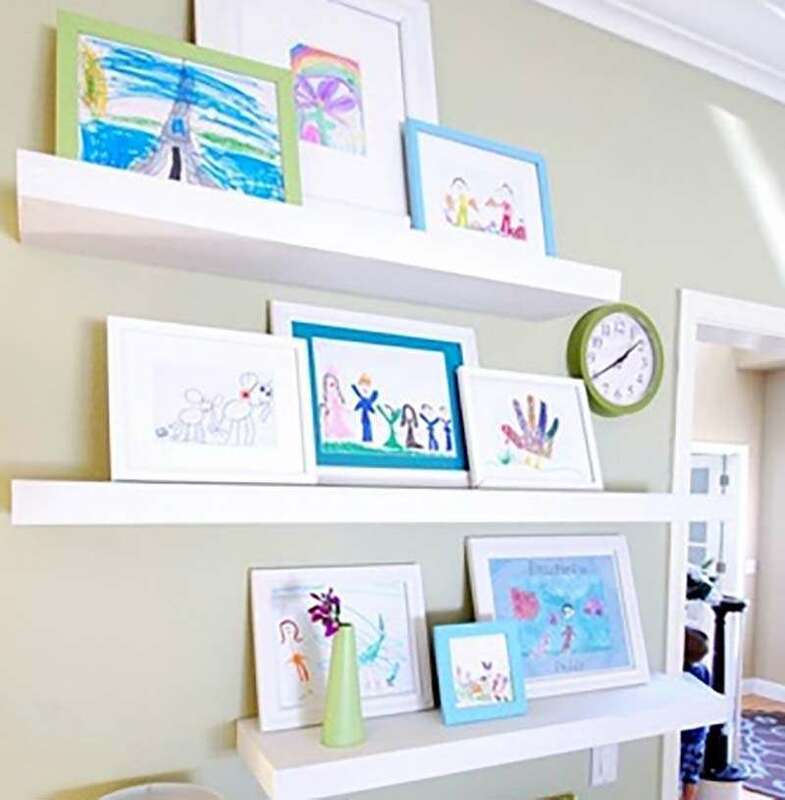 Framing your child’s artwork or favorite piece of ingenuity can give an otherwise boring wall real moxie, along with a well-deserved feeling of accomplishment for them. If in a child’s area, say playroom, bedroom or bath, color is your best friend and need not fall into any guidelines. But if you’re planning on displaying little Robbie's Picasso in a more main area of your home, consider having him make a special piece. Bring out whatever color scheme you’ve used in the room by purchasing child friendly paint in these particular shades. 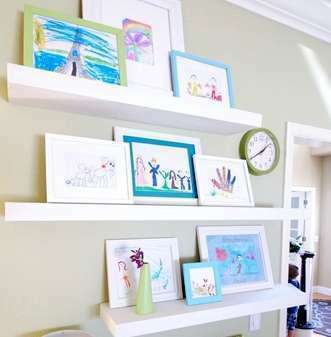 Enjoy an art day and watch your little one masterpiece what will most likely be your new favorite part of the room. Depending on age, this could vary from finger painting to a sweet family portrait. My daughter was barely two and we had her designing our bathroom art using nothing but a small canvas and her wonderfully chubby fingers. Matting and framing can be as inexpensive or over the top as you prefer, but definitely gives a lovely finished touch and greatly takes away from the look of scotch taping a piece of paper to the front of your fridge. 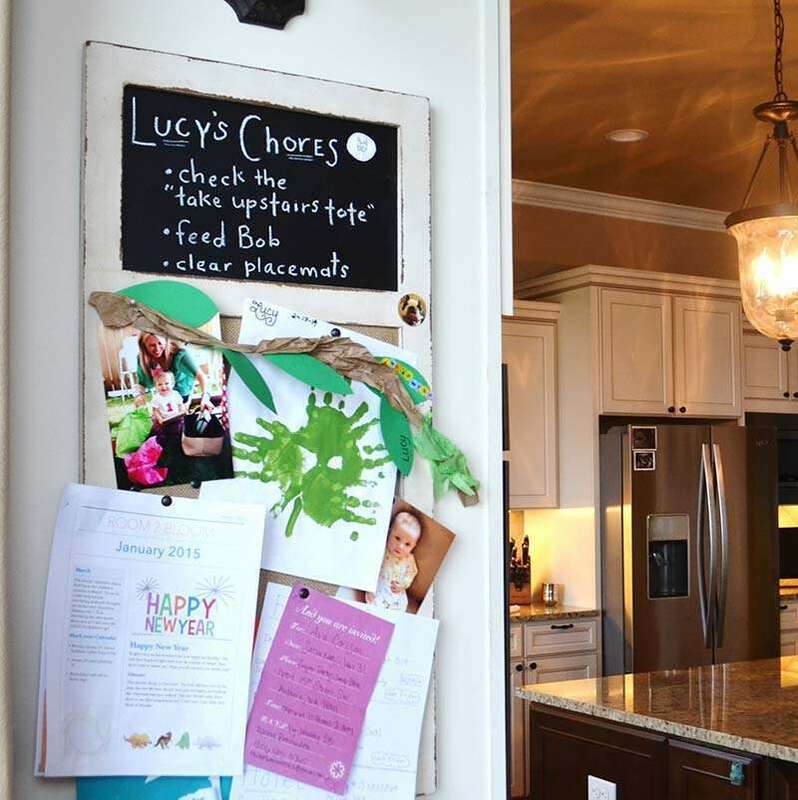 Purchasing a classic chalkboard, bulletin board - or my personal favorite, a duo – can be a fantastic way to list family chores, to-dos, quotes, schedules and anything else worthy of being out for all to see. Ours is happily hung on the side of a kitchen cabinet, and is ever changing. Each month, we write a goal for our three year old, and although she cannot yet read the white chalk, I can promise you that she knows what it says. This helps with not only having a behavior expectation on display, it also sends a powerful message to older ones that this is significant enough to have up and in view every day. The bulletin board makes for terrific grounds when needing a place to tack up school newsletters, deserving mail, do not forgets, family photographs and anything else praiseworthy of a spot. It is sure to become a convenient and handy community board for all that gives a certain organizational feel to the room. Whether you have a designated play room or simply a corner dedicated to toys, bringing order to this snowstorm of books and tiny figurines can be feel like an endless task and will easily take away from any decorating you may have set into place. Finding a small (or large) basket bookcase can become the shovel of your dreams when looking for an answer to the piles. We found our living room shelving unit at a one stop department store and selected a dark wood palate to match the coffee table. I rotated cream and camel canvas bins within its walls and then dedicated each to one type of object – plastic foods and kitchenware go here, flashcards go there, puzzle pieces in this one, stuffed animals in that one, and so on. Sorting toys and literature into their respectable groups can also encourage organizational skills for your kiddos and categorizing development for the younger crowd. And all the while helping you keep your sanity and your living room keep its gorgeous area rug clear. 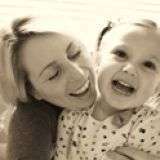 This next idea is for homes that encompass early readers or tiny people who someday will be. Decorate using words. 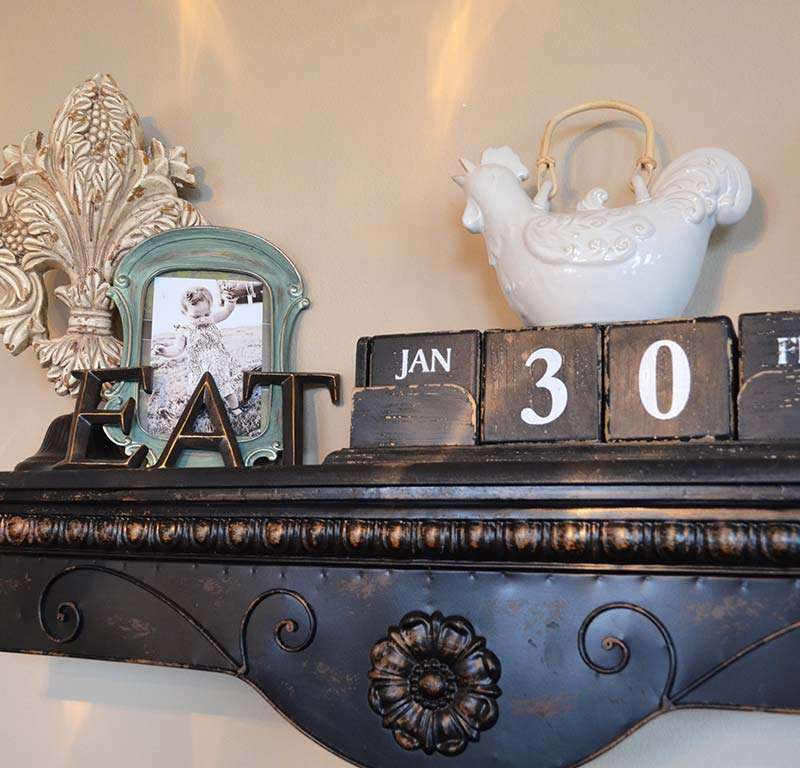 Letter ornaments and wall monograms are big right now and you’ll find many households proudly displaying their shared initial. But my advice is to take it a step further. Think of fun ways to describe a common room in your house using one word. I have the simple phrase EAT sitting on a shelf in our kitchen and cannot tell you how many people smile at its short and sweet honesty. Bold and bronzed letters B-A-T-H don a wall in our master bathroom and our little one is already identifying their names. Think to yourself what other words best chronicle the happenings in your favorite room. GATHER is a sweet coin for a dining or family room, while WASH deserves itself a spot in a laundry space. Just another way to spruce up your castle that your kids are sure to notice and admire. Surely the whole idea behind decorating a space is to have fun and who better than the tiny experts to let ride along? Enjoy, laugh, and let those creative fingers be your guide.